1. Accidental Intentions turned three yesterday. True life. I can’t believe I’ve been blogging for three years. What started as a way to document my training for my first 5K has become substantially more than that, and for those of you who’ve stuck around: thank you. Blogging is nothing without engagement, and I truly appreciate each and every one of you. Here’s to Year Four! Yesterday was also my two-year Chicago birthday/anniversary/whatever you want to call it. I moved to Chicago two years ago yesterday, that’s the point. I don’t really know where I expected to be two years into being a Chicagoan, but I’m pretty sure I didn’t expect to be where I am. Here’s to Year Three! 2. I have a problem. Earlier this year, a Running Times showed up in my mailbox. I never subscribed to Running Times, so this was quite the surprise. My CARA membership comes with a year’s subscription to Runner’s World, and my first Running Times came soon after I renewed my CARA membership, so I figured there had been some mixup and for 2014, I’d get Running Times instead of Runner’s World. Not the worst thing ever, despite the fact that I’m not up to Running Times standards. Then a couple of months ago, Runner’s World started appearing in my mailbox. I got three Runner’s Worlds in a row with no Running Times, so then I assumed my subscription had been switched to Runner’s World, and that would be that. BUT THEN last week I came home and saw a new Running Times sitting on my kitchen table o.O . I still have no idea why I’m getting that magazine, but I’m starting to feel very overwhelmed by all the running reading I have to do (because never in my life have I been the type of person to throw a magazine away without reading it cover to cover — or throw a magazine away, period, but this is not the time or place to get into my magazine hoarding tendencies 😛 ). 3. On Sunday, I took advantage of my Steppenwolf RED card (seriously — if you are 29 or younger and have even a passing interest in live theater, you need a RED card. It’s a stupid good deal) and went to see This is Our Youth, starring Kieran Culkin (brother of Macaulay), Tavi Gevinson (who, if you, like me, subscribed to Teen Vogue eight years ago or so, you may remember as the insane fashion prodigy from Oak Park), and Michael Cera. Yes, that Michael Cera. Juno/Arrested Development/Nick & Norah’s Infinite Playlist/Superbad/too many others to list Michael Cera. This is Our Youth, like every other show I’ve seen at Steppenwolf, was fantastic, but HOLY SMOKES YOU GUYS I SAW MICHAEL CERA. Hahaha. Cannot get over it. He was right THERE, you know?! The show is in Steppenwolf’s Upstairs Theatre, which is a relatively small space, so it’s not like you’re five billion light years away up in some balcony where you’re all, “Mmm, yep, I think those moving dots down there are people.” No, you are, at most, maybe 15 rows away from the stage. GAH. Aside from seeing Fall Out Boy at the Metro, I think this is the closest I’ve ever been proximity-wise to people who are legitimately famous — not just my-own-little-world famous, like elite runners or random musicians I happen to like or dancers I admire, but actually more-or-less household name famous. I’m still starstruck, and it’s been five days. ← Run for Autism Bake Sale: Auction Now Open! Hahaha I think it’d be a better problem to have if I had more free time! Or rather, if I used my free time more wisely (less Facebook, more reading 😛 ). 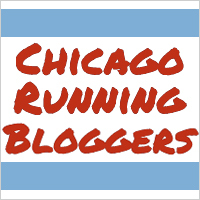 Happy blogiversary and Chicago anni! I really really enjoy Running Times!!! Have fun reading it… for however much longer it mysteriously shows up. Ha! Happy anniversaries!!! That reminds me- I totally missed my 6 year Chicago-versary. Oops! I saw Tracy Morgan on a plane in May. He was such a nice guy! Wow, that’s so cool! I always assume celebrities take their own planes places, even though I imagine that’s definitely not always the case.